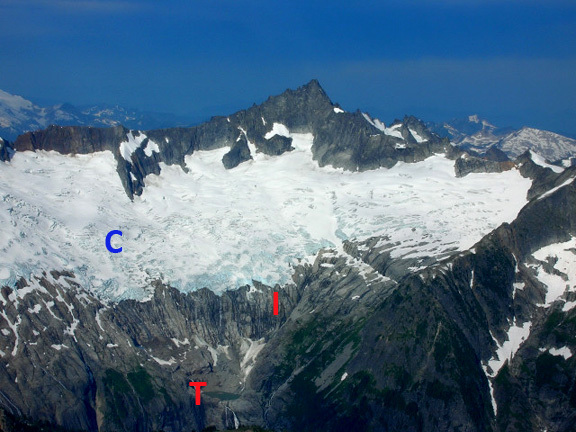 Boston Glacier is the largest glacier in the North Cascades with an area of just over 6 square kilometers. The is a steep, wide slope glacier that currently lacks any type of main terminus tongue or valley section. The glacier is extraordinarily heavily crevassed this is due a steep slope, a smooth hard bedrock basal slope and high accumulation rates. In 1986 the first time I stepped onto this glacier is was immediately apparent that traversing the glacier in any direction was not wise and this glacier would be a poor choice for detailed observations. Richard Hubley, UWashington in the 1950’s chronicled the beginning of an advance for the glacier. 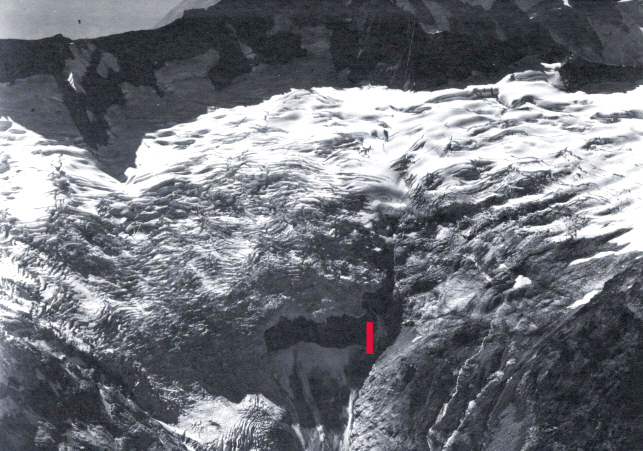 A series of aerial photographs of this glacier from 1960 to 1979 by Austin Post, USGS indicate the glacier remained in an advanced position. 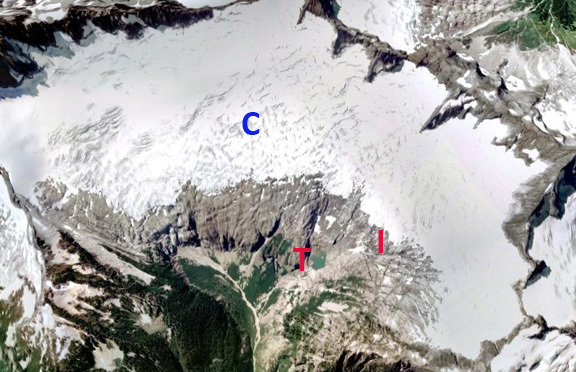 By 1998 Granshaw and Fountain (2006) noted retreat and glacier area loss had begun. 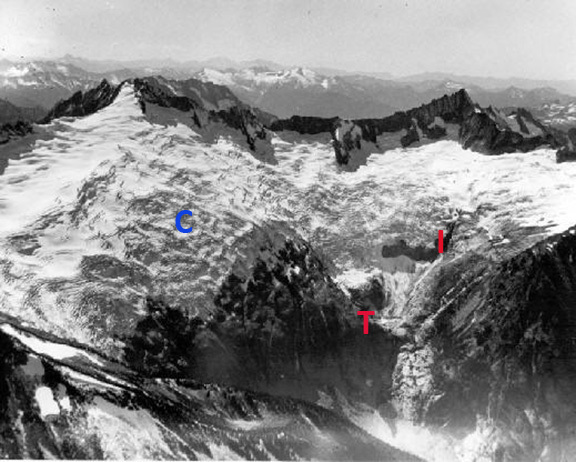 Here we examine a series of images from 1955-2014 to identify the changes in the terminus and crevassing on this glacier. In each image C,I and T are in the same location. In 1955 the Richard Hubley image indicates the main terminus has advanced down a steep bedrock step to a small basin, I indicates the west side of the step. In 1972 an Austin Post image indicates the main terminus has descended a second step to end at a small lake basin (T). The crevasse density in a grid of 40,000 square meters around point C indicate that 55% of the glacier surface is a crevasse feature. A 1998 Google Earth image indicates the terminus has retreated from the small lake basin (T) but is still below the steep bedrock step (I), a 200-250 m retreat. At Point C crevassing has been reduced to 30% of the surface area. By 2005 and 2006 the glacier has retreated from the basin below the steep bedrock step a retreat of 650 m since 1972, and 400 m since 1998. Crevassing at Point C is nw 25% of the surface area. This indicates crevassing has decreased by 50% since 1972. This glacier remains large and vigorous in its flow. The decrease in crevassing indicates some deceleration. The crevasse pattern is caused by the thin ice, for the size of the glacier, passing over small bedrock knobs. The red arrows in the last image indicate the deglaciated bedrock knobs and the blue arrows the pattern of crevassing going over the knob. This is a 2009 picture, the terminus is quite thin indicating retreat is ongoing. The retreat of this glacier follows that of Quien Sabe Glacier over the ridge to the south and McAllister Glacier 10 km to the west. 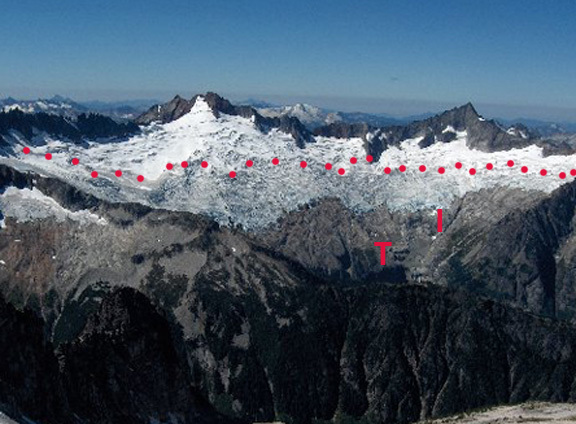 The glacier is like all 47 glaciers we have observed in the North Cascades retreating. 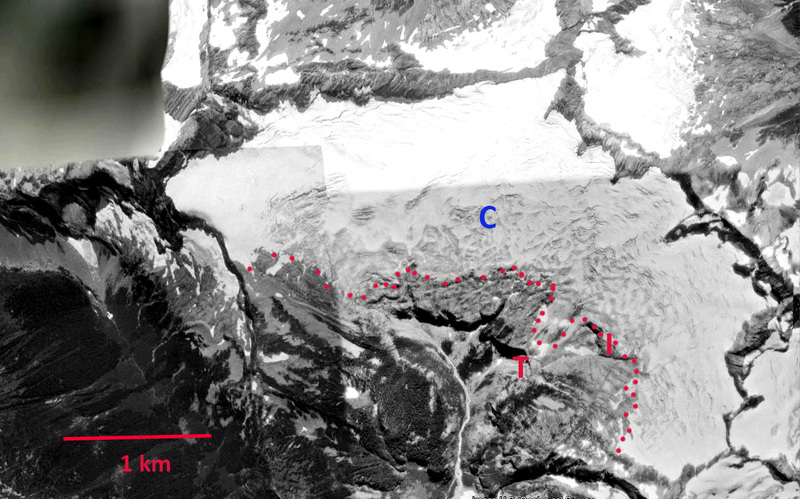 This entry was posted in Glacier Observations and tagged boston glacier crevasses, boston glacier retreat, north cascade glacier retreat. Bookmark the permalink.